Last night the Knox County Commission heard from TDOT, Knoxville Area Rescue Squad and the Corcoran Family about Chapman Highway. 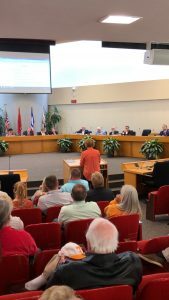 After the meeting, I had a chance to ask Wendy Corcoran with the Knoxville Mayor and current council have been the one entity to block a James White Parkway Expansion. Can this be an issue for the 4 City Council and 1 City of Knoxville Mayor races for 2019. Candidates Be Prepared, know Chapman Highway.